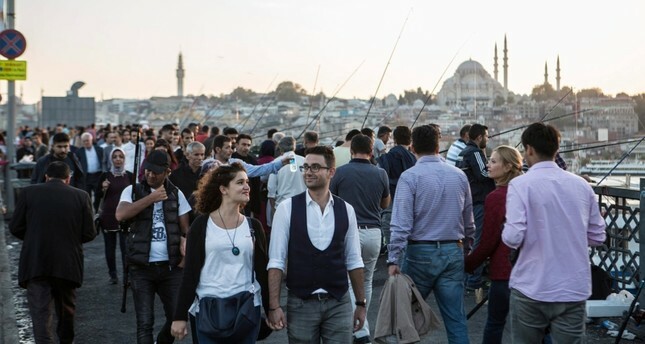 Turkey's population grew by nearly 1.2 million in 2018 to surpass 82 million, according to the Turkish Statistical Institute (TurkStat). According to the figures based on the official address-based population registration system (ADNKS) released Friday, as of December 31, 2018 the population reached 82,003,882, recording an increase of 1,193,357 people year-on-year. Istanbul was again Turkey's most populous city, with over 15 million people, constituting 18.4 percent of the total population. The second and third most populous provinces also remained unchanged with Ankara and Izmir following Istanbul with 5.5 million and 4.3 million, respectively. On the other hand, the northeastern Bayburt province was the least populated province of Turkey, with a total population slightly over 82,000. Fresh data also showed that the annual population growth rate increased to 1.47 percent in 2018 from 1.24 in 2017. The ratio of the male population to the female population appeared to be in favor of the male population, with 41,139,980 men representing 50.2 percent of the total population and 40,863,902 women constituting 49.8 percent, TurkStat data showed. The median age rose to 32 in 2018 from 31.7 in 2017. The figure was 31.4 for males and 32.7 for females, while Sinop, Balıkesir and Giresun had the highest median ages with 40.3, 39.9 and 39.6, respectively. Southeastern provinces again had the youngest percentage of the population, with Şanlıurfa, Şırnak and Ağrı having the lowest median age with 19.8, 20.7 and 21.4. The number of people in the 15-64 working age group increased by 1.4 percent compared to the previous year to reach 67.8 percent, while the proportion of children aged 0-14 was 23.4 percent and for those aged 65 and over it was 8.8 percent in 2018, TurkStat said. The institute said 92.3 percent of Turkey's population lives in cities and district centers – down 0.2 percentage points from 2017 – versus 7.7 percent in towns and villages. Turkey's population density — the number of persons per square kilometer — also surged by 2 persons on a yearly basis to reach 107 last year.